In 2000, I started a gratitude journal. I’m not sure where I got the idea, but I’m guessing it was probably from Oprah. Each entry lists things that I’m grateful for in my life. Anytime I’m feeling down or ungrateful, I pull out the journal and review my past entries. I’ve been writing in this journal now for 11 years. I admit not often enough though! Writing and reading the entries has been a very powerful reminder of having gratitude in your life. It is a journal that I know I will treasure for years to come. As soon as my son can speak, I plan to start a gratitude journal with him where I will record his thoughts. As he grows, I plan to teach him to record things that he is thankful for in his life. 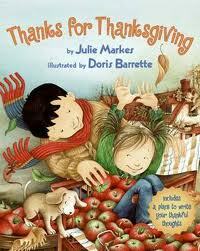 Thanks for Thanksgiving by Julie Markes and illustrated by Doris Barrette is a perfect book to introduce gratitude. The simple text such as, ” Thank you for the fall and gold leaves floating by.” and ” Thank you for Mommy and warm, cozy cuddles.” pairs with beautiful and whimsical watercolor illustrations. At the end of the story is a page for you and your child to write your own thankful thoughts. I think this may be one of my latest favorite books that I’ve discovered. Why not start a gratitude journal with your child? All you need is a notebook or journal. Your child could even decorate the cover of the journal. Here are a few more creative ways that I’ve found to record your child’s thankful thoughts. Over at Toddler Approved, they are making Gratitude Turkey Treat Jars. They are making Thankful Trees at The Mud Pie Makers. Do you have a favorite idea to illustrate gratitude with children? I’d love to hear your ideas. Thanks for sharing our idea on your site!! I love gratitude journals and this was a great reminder for me to get writing in mine again. Thanks!